Since 1989, at the start of his new business, Sandro Colarieti decided to develop the cases he had created to store his watches by producing a small series of watch winders for himself and his friends. As a great Patek Philippe watch collector, he presented his invention to the famous watchmaking firm in 1990, which after a year of testing, decided to order 500 watch winders. Thanks to this collaboration, Scatola del Tempo soon became known to collectors all over the world. The winder was born and appreciated! Collector enthusiasm is constantly growing as do their expectations, and their requests in terms of customisation and capacity are becoming increasingly challenging. The range is being expanded all the time: now the boxes can hold one, two or six timepieces and there are now some capable of housing as many as one hundred watches. To surprise and seduce the most demanding enthusiasts, the Como Maison now creates entirely custom-made furniture in the rarest, most precious and most innovative materials. And to provide the most sophisticated aesthetics and customisation, Scatola del Tempo has set up partnerships with celebrated designers and interior architects. 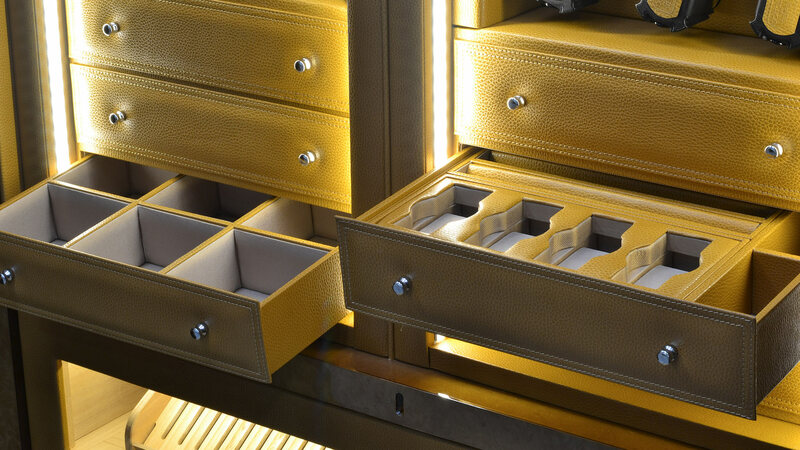 Together, they create spaces entirely dedicated to people’s passion for watches, special units that can be integrated into walk-in closets, bedrooms, living rooms or even a safe room, thus meeting all of collector’s requirements and security concerns. A nabuk clad cabinet made to measure for a client who wished to admire his watches (and wind them up) while sitting comfortably in the living room. Stargate is equipped with 42 rotors to recharge automatic watches. Two drawers with Spanish cedar interior are designed to hold cigars. The cabinet has a fingerprint opening mechanism. One of the Scatola del Tempo’s latest creations, this model is leather bound, has a tactile LED lighting system, and 12 independent rotors to rewind automatic watches of any size. Made in shiny lacquered zebrawood, this reinforced security cabinet with a fingerprint opening system is equipped with 21 independent rotors to rewind even large size automatic watches. Do you keep your watches properly when you are not wearing them?